In Reshipora, a community in Kashmir's Tral subdistrict, young men look down on the funeral of an Indian Army soldier and his father, who were killed during an attack by Pakistani militants on a base in Jammu. Many in rural areas join the Indian military due to high unemployment. But stories of violence and deprivation are not the only ones to be told in Kashmir. There is a tradition in Islam that when a baby is born, a male relative tenderly whispers the azan, the call to prayer, into the ear of the infant. When Masrat Jan was born during the peak of the militancy, a curfew meant no one — except her pregnant mother and grandmother — could leave the house to deliver the baby. Ms. Jan’s grandmother whispered those words instead, to a child wrapped in the warmth of her mother’s arms. Masrat Jan, 23, a young female photojournalist, covers clashes between Kashmiri protesters and police. The protests marked the five year anniversary of the execution of political figure Afzal Guru, who was hanged on February 9, 2013, for his involvement in the 2001 attack on the Indian Parliament. Unrest rocked the valley again this week after at least 20 people, 16 militants and four civilians, were killed in fighting between security forces and separatists. Authorities quickly implemented curfews and closed schools, as well as cut internet access, in a move to stifle protests and growing frustrations from residents. While Kashmir is largely known to the world for its strife, Ms. Jan and her contemporaries know there are other stories to be told. Against all odds, they are trying to build stable, prosperous lives in a place that has been in conflict since they were born. The bucolic area has been disputed territory for decades. 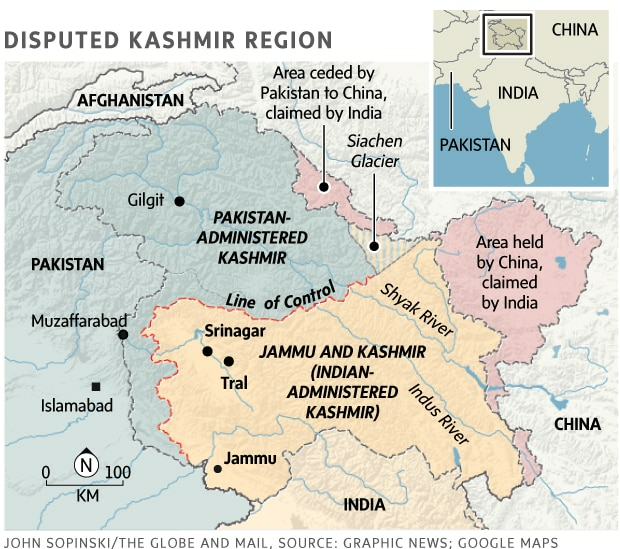 Thirty years ago, Kashmiris first attempted a separatist insurgency with help from Pakistan, but India, which administers the region, is loathe to loosen its grip on land that is both rich in natural resources and strategically and symbolically valuable. The ties that bind Ms. Jan to Kashmir fray each day. Millennials there struggle to thrive where it seems the state deliberately thwarts political and entrepreneurial progress. Her brother has already left in search of better work and she too anticipates moving away. The region has the highest unemployment rates in India; almost 25 per cent of youth between the ages of 18-29 are out of work— compared to 13 per cent nationally. Last summer, the Kashmiri police force was overwhelmed when they posted 698 entry-level positions and received more than 67,000 applications. “Everybody is struggling for jobs. So many people are leaving Kashmir to sustain themselves, leaving for Delhi and Bangalore,” says Uzma Bhat, 24, a fashion entrepreneur. The government doesn’t track the internal movement of Kashmir’s residents, but the anecdotal evidence suggests that among urban and rural Kashmiris, the exodus is quickening. Ms. Bhat also feels as though life in the valley is turbulent and unable to forecast. Over her lifetime, the region once famed for its apple orchards, willow cricket bats and wool has struggled economically amid protests and curfews. 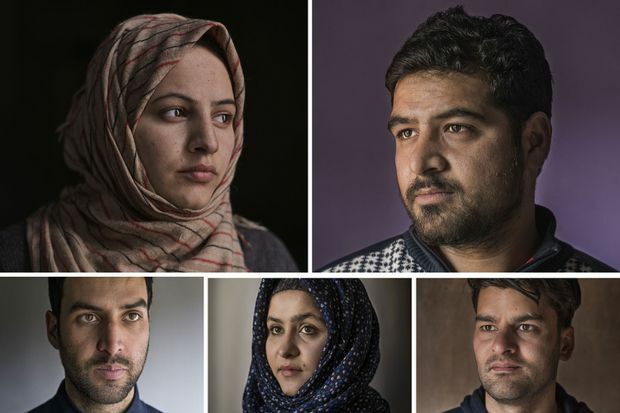 In a country whose physical infrastructure is weak, many are forced to turn to the internet as a tool of survival, one of the most critical lifelines to arrive in Kashmir over the last decade. India is the third largest internet consumer base in the world — and its arrival to the far reaches of the northern state of Jammu and Kashmir has created jobs for hundreds of young adults. Ms. Bhat sources prints and patterns from local vendors, converting the raw fabric into hijabs and dresses she sells online — using the internet as a digital storefront. Uzma Bhat is interviewed for a local news show on young female entrepreneurs at her home in Srinagar. But the connection she has made with clients outside of her community is fragile. Unlike other parts of the country, internet outages here are frequent and sustained. These shutdowns are not a function of rickety infrastructure; the internet is fickle by design, a utility controlled by the state that can be quickly cut. Of the 65 instances of internet cutting throughout the country, 29 occurred in Kashmir— the worst year on record. Since 2012, there have been 57 recorded shutdowns in the region, says the New Delhi-based Software Freedom Law Centre. A number of entrepreneurs expressed frustration that the government is trying to economically strangle them as punishment for past insurrections by Kashmiris against the Indian state. The internet is a threat to the state in another way: it is a platform for documenting — and sharing — the perceived heavy-handedness of security forces. By most estimates, India has placed 400,000 police and soldiers in Kashmir and their interactions with young residents — many of whom call it an “occupation” — result in daily friction. The internet shutdowns follow a years-long strategy by the Indian government to discourage the gathering of youth in public spaces, which drove them online. The famed cinema halls in Srinagar — once packed with eager youth taking in Bollywood films — have long shuttered or have been repurposed as military bases. As recently as three years ago, there were no cafés in the city. Recently, though, restrictions have eased and the public spaces are re-emerging. Ms. Bhat is working towards a physical location; she hopes hard real estate will provide a buffer for a tenuous digital presence. One of the most popular cafes in the city, Winterfell, is based on the popular television show Game of Thrones. Run by Kamran Nisar, it even features a hand-crafted throne from 160 kilograms of wrought-iron. In searching for a theme to match the uncertainty of life valley, he felt the program best encapsulated the region and lives of a generation that feel like pawns between India and Pakistan. Pakistan has long-fuelled the militancy — at times with foreign fighters — and India continues to respond with violent counterinsurgency operations, some of which have killed civilians. For many young Kashmiris though, the conflict — and its politics — is wearing thin. Kamran Nisar, 28, runs the popular Winterfell Café in Srinagar. He worked as an engineer in Turkey and the United Arab Emirates before returning to Kashmir to open his café. Each Sunday, Mr. Nisar, 28, hosts salon sessions on topics ranging from feminism to entrepreneurship. The attendees are an eclectic mix: among them are bankers, radio hosts, engineers and psychologists. The discussions are lively — and at times heated — but are a welcome respite from the heavy silence that once draped over the city. He often questions his choice to return and the sacrifice of stability. “I will never, ever earn as much as I did abroad. I will never have the life that I had there,” he says. Family often prods him to move back when the stress of running a businesses overwhelms him. “I tell them I’m satisfied. I’m trying my part for society,” he says, hoping to lay the groundwork for patrons to become more engaged and critical. In rural areas of the region — where the almost three-quarters of residents reside — this type of interaction continues. “Last year in Tral, there were 76 days where children couldn’t go to school because of skirmishes between militants and Indian security forces,” says Noor Ul Hassan. “When I was in school, it was often two to three days a week we had to stay home,” he says. In spite of this, the area boasts one of the highest rates of literacy in the region — Mr. Hassan, 30, has a number of diplomas and certificates and a postgraduate degree in management. But Tral is also as a hotbed for the militancy, drawing its ranks from frustrated residents. Mr. Hassan’s best friend joined two years ago, and was killed shortly after. Noor Ul Hassan, a local activist and storeowner, is shown in Shikargah, a wildlife reserve in Tral. In spite of its notoriety with security forces, Mr. Hassan says there is a deep strength to the community in Tral. “If Muslims die, Sikhs will come to funerals. And if a Hindu dies and there is no family here, Muslims will lay the person to rest,” he says. Almost all of the seven million people living in the Kashmir Valley are Muslim: less than two per cent are Hindu. At the peak of the insurgency in the 1990s, the region’s Hindu community fled for safety, fearing reprisals in an ethnically charged conflict. The family escaped to the south, where they lived a “miserable life,” having left behind their newly-constructed family home. But in 2010, Mr. Pandit, 27, and other Hindus began to return to Srinagar and the surrounding areas through a resettlement program promoted by the Indian government. Viman Pandit, 27, cradles his first daughter a day after she was born at Sheikhpora resettlement camp in Budgam. There is little incentive for investment in an area with suicide attacks, curfews and internet shutdowns. Mr. Pandit is one of the lucky ones — trained as a civil engineer, he has a comfortable job with the government and is able to provide for his young family. He briefly revisited the site of his family’s old house, only to find it charred and crumbling. The apple trees he recalls from the hazy memories of his youth are gone. Like other Hindus, Mr. Pandit wears a mauli, a bright red bracelet made of yarn on his right hand. He had never taken it off, but feared identifying himself in public. Keeping it on was one of the hardest decisions he had to make. Clockwise from top left: Masrat Jan, Viman Pandit, Kamran Nisar, Uzma Bhat and Noor Ul Hassan.